We’re four days into our Sea to Shining Sea High School Football Tour and the biggest thing Trisha Hoffman and I have learned is that it takes a lot to drive cross-country and write regularly. We’re having a blast, but my writing has fallen behind, so I’m going to play a little catch-up this morning from Santa Fe, New Mexico. Our first stop on Wednesday was in Flagstaff, Arizona where I was able to snap my first high school football field photos. As I mentioned in Thursday’s story, Flagstaff has two schools – Flagstaff High and Coconino High School. The above photo is of the boxed-in home grandstands at Coconino’s Cromer Field. At 7,000 feet elevation, it can get quite chilly by the end of the season. When we awoke Thursday morning, it was 33 degrees with frost on the windshield. I’m sure that the Panther fans are happy to have the covered grandstands when Flagstaff gets its unpredictable chilly weather. Cromer Field, which was dedicated in the 1960’s, underwent a $3 million facelift a couple years ago. 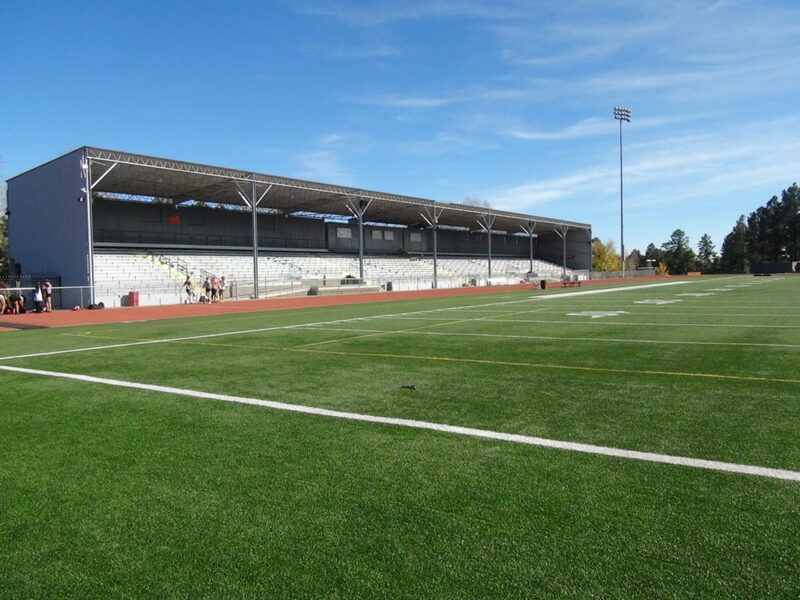 During the renovation, Coconino played at Northern Arizona University‘s Walkup Skydome, which is the home of crosstown rival Flagstaff. Northern Arizona University is home of the Flagstaff High School Eagles. The J. Lawrence Walkup Skydome seats 10,000 fans, who never have to worry about the elements because it’s always a comfy 72 degrees. Opened in 1979, at the time, it was the largest wood-span structure in the world. The Skydome, which was originally named the Ensphere, was built at a cost of more than $8 million over 6.2 acres, with the roof spanning more than 500 feet and rising 142 feet above the playing surface. 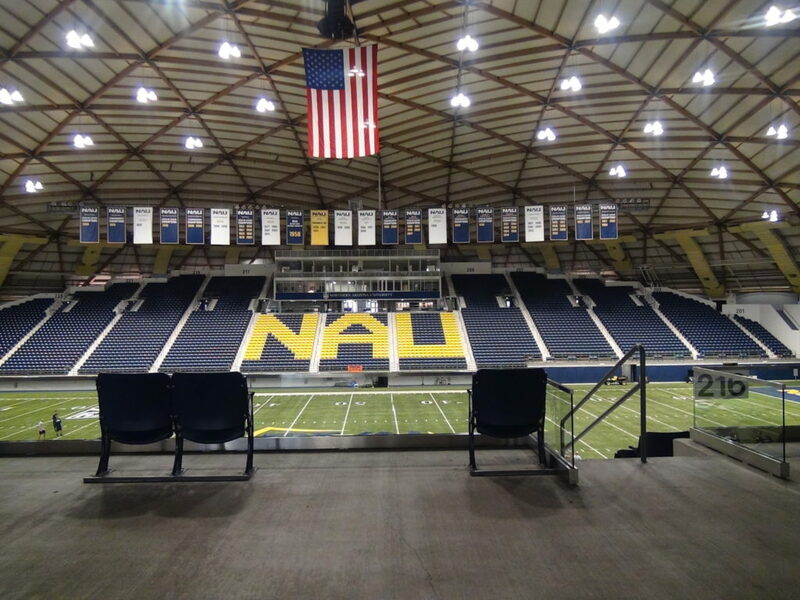 The bright white dome, which can be seen from nearby Interstate 40, also serves as the home court for NAU basketball. Last year, Flagstaff celebrated playing its 200th game in the dome. The Eagles have won four overall state championships in football with all of them coming between 1981 and 1984 in 4A. However, recently Flagstaff High has been in a drought, having not made the postseason since 2007. Coconino has two state championship – 1968 and 1974. Friday night, the two met in their annual city championship rivalry game at the Walkup Skydome. It was the 46th time that the two have met since 1969. Coconino snapped a three-game losing streak against Flagstaff with a 22-13 victory that narrows the Flagstaff’s series lead in the series to 24-22. The game signaled the end of the 2014 season for both teams with neither qualifying for the postseason. Coconino finished 3-7 overall, while Flagstaff ended with a 2-8 mark. – The Hilton Garden Inn in Flagstaff is an awesome place to stay with a great breakfast buffet, especially if you’re a Diamond Club member as part of Hilton Honors, which we are. That means free breakfast! The staff was incredibly polite and that makes a difference when you’re driving across this great country. – Ate Wednesday night dinner at Buster’s Restaurant & Bar – great steak! While winding down watched the San Francisco Giants win their third World Series in five years. 99-percent of the time we eat at the bar, because you learn more about the area. If you go to Buster’s bar, make sure to talk with Cory, who’s a great bartender and person, who has traveled the world and is now back in her hometown. – Founded in 1882, Flagstaff’s Historic Downtown is filled with lots of cool old buildings. – Historic Route 66 runs through Flagstaff. – At lunch at Majerle’s Sports Grill on Route 66. Took me a few seconds to realize that the restaurant is named after NBA veteran Dan Majerle, who is the current head basketball coach at Grand Canyon University. The chicken tacos were spicy! More to come on Arizona, including our stopping on the Hopi Reservation to watch a game between Hopi High School and Rock Point, plus a video of Trisha and me on the corner in Winslow, Arizona…a la The Eagles, the band, not the team. Hoover, Alabama – Day 9 or is it 10?